Doctor Hoot here, hello. I am Gadget Island’s news anchor. My job is to know about and report everything that happens here on the island or close by. My Christian name isn’t actually Doctor, I don’t diagnose illnesses and give out medicine, but no one on Gadget Island knows my real name. I think I’ve even forgotten it myself. I’ve lived on Gadget Island longer than most, but let me tell you my whole life story. My life began far away from here. I was born in the Other World, in a place called Telly Valley. I am a barneal owl. Yep, you heard right. You see, my mother was a small, sweet boreal owl, and my father a large, handsome barn owl. My mother was the nesting sort, whilst my father was a wanderer by nature. I have characteristics from both parents. One beautiful evening my mother was looking for a nest hole, and my father a new territory, when they bumped into each other. Both found what they were looking for and together they moved into a birdbox attached to a large pine tree. You heard right, in the Other World birds really do live in boxes. It isn’t quite as bad as it sounds. The box was actually very comfortable, and it became my first home. Soon after I hatched, I began to practise flying. My father taught me. When I was able to fly far enough, my father wanted to show me something. A stone’s throw away from our nesting tree was, you see, a house. My father flew ahead and landed on a tree in the house’s garden, I landed on a branch next to him. The sun had already sunk down and it was evening. We owls prefer to move around in the dark. The people in the house were still awake. The bright light from the windows lit the dark forest. I noticed that in the dark, it was easy to see into the lit house. “Look, my boy,” my father said, and pointed at the window in front of us, “That’s the living room”. I nodded, even though I didn’t yet understand what living room meant. “And that there is a television”, my father continued, stretching his head towards the box in the corner of the room. Ahh, back then televisions looked very different to how they do now, but to me – a small little owl – it was the most wonderful device I’d ever seen. The image on the television was alive and changing. But even more exciting than the moving picture was the owl who appeared on the screen between programmes. I couldn’t believe my eyes. How could the owl have got inside the television? My father told me that the owl was his brother, my uncle, who worked in television as a channel identifier. My father said the owl wasn’t inside the box at all, but instead that he was being shown at the same time on all TV receivers in all the homes where that channel was being watched. I thought it was amazing. I was a relative of a famous TV owl. I couldn’t get the thought out of my head. I returned to that tree the next evening and every evening after that, just to see my uncle appearing on the television screen. The more television I watched, the more that world began to fascinate me. Soon, the late-night news became my favourite programme. I really wanted to meet my uncle, so that I could ask more about TV work. But as you can imagine, he was a busy man. Secretly, I wondered whether, since my uncle had once managed to become a TV owl, could I become one too? Although I didn’t want to become a channel identifier; I wanted to become the actual news reader. Over the years I grew older, televisions changed, and the news broadcasts changed form. Eventually the TV owl was replaced too. I was the first to notice, as I was the only one in my family who watched television regularly. The next day I met my uncle for the first time. 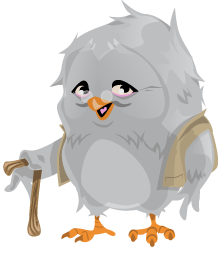 He told me that he had retired; they had wanted a new and younger owl to replace him. I asked my uncle about his work, and eventually I managed to build up the courage to ask: “How could I become a newsreader?” My uncle looked at me for a moment, with eyes wide, and then began to laugh. “You can’t become a newsreader, not in this world.” At first I felt embarrassed. How could I ever have imagined that I could get such an important job. But I thought about it more, and I changed my mind. I would search for as long as it took to find the world’s most important news, and if I were to do a report on the news, surely I would get to work in the news. The next morning I left on my trip. I flew at night and rested during the day, searching for the most important news topics near and far. I flew over forests, fields and the sea, until I ended up in the eye of a terrible storm. I was right out over the open sea and didn’t have anywhere to land. I spread my wings as wide as I could and headed into the wind. Then a powerful current of air caught me and knocked me off path. I was thrown about in the air, being knocked in every direction. Soon my head was in such a whirl that I no longer knew which direction was up and which was down. I couldn’t fight it, so I closed my eyes and surrendered to wherever the wind would take me. I woke up to bright sunshine. I was lying on the soft sand of a beach. One of my wings was damaged, but otherwise I was fine. Carefully, I got up and looked around me. My head was still spinning, and I didn’t realise straight away where I was. The storm had dumped me on some unfamiliar island. In front of me I saw a verdant forest, behind which a large mountain rose up. I heard the roar of water, there was a waterfall on the side of the mountain. I thought it was all a dream, as I’d never seen such a beautiful island before. I wanted to explore the island more, but because I couldn’t fly, I had to get about on foot. There were folk living on the island. I noticed their tracks left in the sand. The next thing I noticed was that I was being watched. I tried to say hello to the pair of eyes hidden in the bushes, but I didn’t get any reply. Soon, two sinewy cheetahs appeared in front of me. “Hello”, I began, but the cheetahs didn’t reply. Instead they took me with them to their chief’s home. The chief was an old and wise looking cheetah and he was sat watching the news on a television! “Hello”, I began again, but with one quick hiss the cheetah silenced me. The chief’s news time was not to be interrupted. I sat, waiting. My wing was hurting and I was hungry. I wondered what the cheetahs were going to do to me. I had come to the island by accident and I could leave as soon as my wing had healed. On the other hand, I was interested in this island, where a television seemed to be working in the middle of pure nature. Could this be my big news? After the news broadcast had finished, the chief turned off the television and turned to me. He looked at me from head to claw and then asked: “Where have you come from?” I told him that I came from the place he had been watching on the news. “The Other World?” the chief growled. I nodded. Since coming to the island I had started to feel that I had actually arrived in a completely new world. “Are you dangerous?” the chief asked. I hastily shook my head. How could I be dangerous? I couldn’t even fly. And I was small. I told the chief about my journey and how my wing hurt so much that I could barely move. Then the chief asked me to lie down. He bound my wing and gave me some kind of strong remedy as medicine. I felt the pain begin to ease and I fell asleep. My broken wing did not get back into flying shape straight away, so I stayed on the island whilst I waited for it to heal. I spent all my time in the care of the chief, Sir Fast Grace. I found out that he was an important healer and that his family had always lived on the island. He told me that although he knew about the Other World, no one there knew about this island, and so they were scared when I arrived. They wanted to keep to themselves. The chief loved the news, but he didn’t want the chaos he saw on the television coming to the island. But there is plenty more to the Other World! There are good and decent people living there. I told the chief everything I knew about my own world, the Other World. I told him about Telly Valley, about the nesting box, and I soon found myself telling him about my dream of being a newsreader too. He suggested that I start practising both flying and finding news at the same time. I could fly over the island and the area around it and return and tell him what I had seen and heard. I was excited about this job. To begin with I just made short journeys, but as my strength grew, I circled about the island and told the chief everything that I saw. I learnt that there were no electricity pylons on the island, instead the electricity came from Earth-lectric Station, deep underneath the island. I saw how a big hot air balloon flew over the island every day, dropping audiovisual programmes, including games, TV programmes and films for the island’s inhabitants to use. Since I’ve been here, the hot air balloon has become a normal part of life on Gadget Island. The chief of course knew this already, but he didn’t know that a tree had fallen down at the edge of the forest, or that a new hole had appeared in the hot air balloon, and that someone had patched it up. As I’d already gathered loads of these little news stories, and had become something of an expert, the chief gave me the name Doctor Hoot, and ever since I’ve been referred to by that name. At last, my wing had healed enough that I was free to leave. I had found the biggest piece of news of them all, a very special island, Gadget Island. I had also received a wonderful new name. But to my surprise, I wanted to stay. Working as a news anchor in the Other World no longer felt so important. I was already strong enough to fly to the edge of the Other World, but every time I came back. I always brought new news with me. Eventually I found the courage to ask the chief if I could settle down and live on the island. The chief organised a vote. Some of the inhabitants voted for, some against. In the end, the chief’s decision solved the matter. I was allowed to stay. All those who were against me staying thought that I would start to bring problems with me to the island. They were scared that the island would no longer be a safe place to live, and that in my wake others would start to come to the island. Only the last guess was correct. Many years after arriving on the island, two seals met at the cliffs. Both of them had, by chance, swum past the island, climbed ashore to rest, and found each other. Perhaps you already know the seal family. Sally and Steven were the first to move to the island after me. Next to come to the island was Don Wolf, and later many others. With time, the island’s original inhabitants realised that we newcomers didn’t pose any danger. Quite the opposite in fact. We helped them and together we all worked to make the island into a better place to live. This helped them to see that we value the island just as much as they do. The island has become our home to. We have all become friends. Despite what my uncle said, I became a newsreader. Although not in his world. I founded Gadget Island’s first news agency. I bought myself the equipment to make both radio and TV broadcasts. Instead of just telling people what was going on, I started to record the news reports. I make small and quick news reports whilst I’m travelling, and they can be listened to on OpenSea, which is Gadget Island’s own radio channel. Bigger news pieces can be watched daily on the island’s own TV channel: 997. Several years ago we also founded Gadget Island’s news agency, GNA, along with Paul R. Honeypaw and Marymoo the Cow. Paul owns the island’s newspaper – Top News – whilst Marymoo takes care of distributing more entertaining content on social media. As I stated earlier, my friend, and chief of the island, Sir Fast Grace, was already an old man when I arrived on the island. I had the pleasure of knowing him for 15 wonderful years before his time to depart came. To my surprise, I became the new leader of the island. Nowadays we don’t use the word chief any more. My duty is rather to look after the well-being of all the island’s residents, as well as their safety. We make decisions together. This is called democracy. However, the residents of the island trust my judgement when it comes to the most difficult problems. We organise resident meetings at the meeting tree on a regular basis. At the meetings we discuss all things that affect the island. Gadget Island is a real peaceful haven; I know that from decades of experience. Having responsibility for safety, I very rarely come across issues that I can’t resolve immediately. But now the situation is different. A few days ago strange things began to happen on the island. During the evening I was on guard in my look-out tree. The moon was shining, almost full, in the sky, when it suddenly grew dark. I looked up and something big glided over me. I hurried to the protection of the leaves, and from there focused my long-distance vision as far as I could. A building flew over the island, an old mill, and it was heading straight towards the mountain in the centre of the island. To my horror, I noticed that the flying building was intentionally slowing down and landing on the top of the mountain. Who was steering the mill? And why had it come to our island? As a scout I could of course have flown there straight away to find out why the mill was there, but before that I had to warn the island’s residents. Flying up and down over the island would reveal us, so with a long tweet-twoo, I called to my helper Mole McDiggerson, telling him to come to where I was. Mole McDiggerson came to the surface in a gap in the look-out tree’s roots. Owls can get everywhere, except into the ground, thus a wise bird has a mole as his helper. I asked McDiggerson to take the following emergency message to all the island’s inhabitants: No one may leave their home before morning! Meanwhile, I had to find out what the flying mill meant. Silently, I opened my wings and set off. Fear was nipping at my stomach Is Gadget Island’s fate about to change? What strange things are happening here? The owl just told his own life story. Tell your own life story In your life story you can describe the most important events in your life. The activity is to be done in pairs To help with the narration you can use pictures that give hints about what you can talk about in your life story. Go through the pictures first. A separate picture list should be printed for each pair. The story can be saved using an app designed for story narration, such as Story Creator. The life stories can also be videoed. Spoken stories can be converted to text using apps such as Dragon Creator. An aim of the session is for pupils to learn how to talk about their own life. Another aim is for pupils to talk about their own media relationship. Life stories can be shared with parents too using a mobile app.